Oil on canvas, 85 x 125 cm. In a lush landscape featuring both ruins and mountains, a despondent Don Quixote realises he is lost. Like his chivalric heroes, the adventurous knight and his faithful squire Sancho Panza have halted at a crossroads to consider which way to go. Don Quixote glances at Sancho Panza with a somewhat despairing look. With an outstretched hand, the squire attempts to help the indecisive and idealistic knight to see reason. 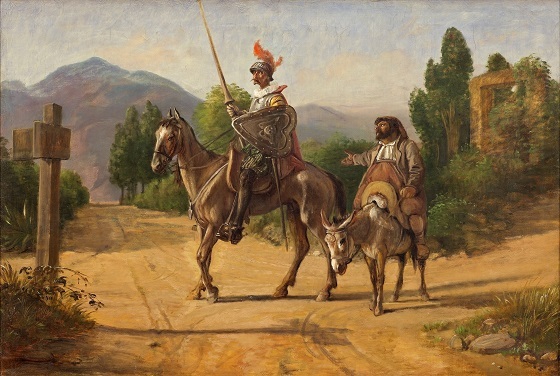 Using the crossroads as his subject, Wilhelm Marstrand sought to illustrate a symbolic scene representing the dilemmas and crises that constantly surround Cervantes’ tragicomic hero. Sancho Panza appears as the sensible companion who attempts – in vain – to keep Don Quixote within the boundaries of reality.